How to Choose the Best Ignition Coils? 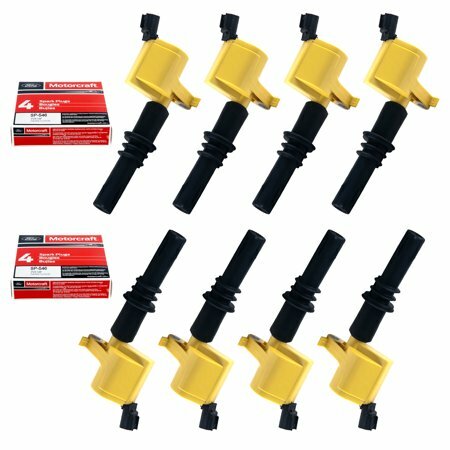 How to Understand That It’s Time to Replace Ignition Coils? If you notice that your automobile fails to function steadily and run smoothly or your vehicle starts to consume more fuel plus you witness a backfire, it’s the right time to inspect the ignition coils. These pieces deal with taking power from the generator and delivering it to the spark plugs. In such a way, they ensure fuel ignition to make the automobile run fast and smooth. If you see that your automobile suffers from ignition coil malfunction, it’s advisable to acquire a fresh ignition coil pack and employ it instead of the old one. The good quality ignition coils are efficient and reliable. They are pretty compact and can be easily installed. Now, let’s see what the best ignition coils are. Moreover, we are going to provide you with some tips on their choice and application. It’s a set, consisting of 8 curved boot ignition coils. It’s suitable for many old Ford, Lincoln and Mercury automobiles. Among the automobiles, which can use these coils, are Ford’s 4.6L and 5.4L V8 F-150 (released before 2003), Explorer (manufactured before 2005) and Expedition (produced before 2004). These ignition coils are made of qualitative copper and feature a winding design, reducing their weight and size, but preserving the supreme quality. Thus, as coils are very light, you will face no problems with mounting them. Moreover, misfires will be eliminated as the ignition coil delivers a high voltage to the spark plugs, leading to high energy output, accompanied by minimum emissions. Nevertheless, sometimes, the curved design may lead to longer and more challenging mounting. But it definitely costs trying as this pack is very enduring and will function pretty long. These ignition coils can run for about 100,000 miles thanks to their resistance to corrosion and abrasion. Moreover, this pack is absolutely inexpensive for a product with such quality. It’s supplied with a lifetime warranty. Bosch is usually associated with electronic appliances. However, the company turns out to be among the best brands dealing with ignition coils. As the company is German, it often supplies pieces for the local market. Thus, its coils are the perfect option for BMW automobiles. Though, this pack is the most pricy on our list, it comprises 6 ignition coils of supreme quality, which are noted for their endurance and reliability. The external construction of these coils has much in common with the older variations while the major differences and updates can be found inside. For example, unlike their predecessors, these items don’t produce any snap sound while being installed. The sound was produced after the old coil seized the spark plug tip. But the new coil utilizes an HV brush and a contact spring, which ensure tighter contact with no sounds produced. The close contact between the spark plug and ignition coil ensures the efficient delivery of high voltage and better performance on the whole. 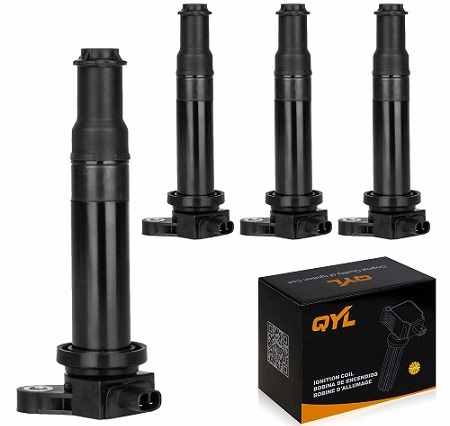 Having the lowest price on this list, QYL ignition coils go in a pack of 4 items. These items were created to meet or surpass OEM performance thanks to internal parts of great quality, including high-quality copper wires plus wire coatings, which are able to withstand cracks and other possible damages, leading to malfunction. Delivering a high voltage output to cope with misfires, such a construction permits the motor to reach high energy with minimum emissions. Besides, while quality remains the same, uniquely wound copper wires decrease their weight and size. So, all in all, these coils prove to be very efficient despite their low price. These ignition coils are simple, reliable and durable. The set is ideal for Japanese automobiles like Nissan Altima and Sentra 2.5L. Being built in accordance with the highest quality standards and showing great performance, these items can serve as direct substitutes to spoilt OEM coils. Consisting of 4 ignition coils, this product is rather pricy in comparison with other sets with the same number of coils. However, that price is normal for a product of supreme quality. Moreover, the manufacturer provides a lifetime warranty. So, if something is wrong with these ignition coils, you have an opportunity to replace them or return your money back. 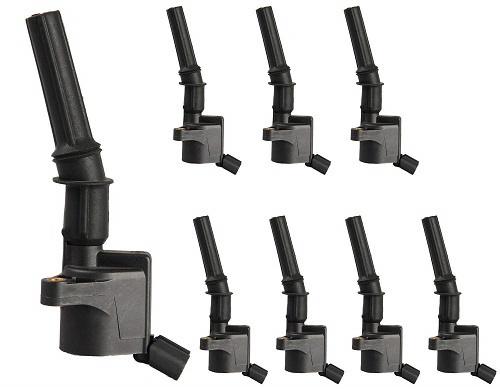 While the majority of their competitors keep traditional 2 prongs, the Parts Galaxy ignition coils feature 3 prong connectors. They conduct the current to the coils’ copper wires for the voltage step up, which results in stronger firing after high voltage gets to the spark plugs. Though this set is pretty expensive, it comprises 8 coils along with additional 8 Motorcarft spark plugs. This pack allows you substituting not only ignition coils but also spark plugs in one go. 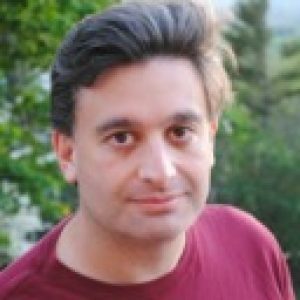 As a result, you will have the whole system updated. And it will lead to better performance, enhanced horsepower, low emissions and normal fuel consumption. These ignition coils are suitable for many Lincoln, Mercury and Ford automobiles, including 5.4L V8 Lincoln Navigator and Mark LT (2008), 4.6L V8 Mercury Mountaineer (2008), Ford Expedition (2005-2008), F-150 (2004-2008), F-250 (2005-2008) and F-350 (2005-2008). Inside, the coils contain a multi-spark epoxy, making them more solid and able to withstand any type of vibrations even if you are racing or driving off-road. The unique coil windings make these coils light and compact without harming their efficiency. The construction makes them meet and surpass OEM ignition coil specifications. So, they are really great substitutes to initial parts. Before purchasing any pack of ignition coils, you must take many factors into consideration. In order to help you, we have prepared a list of key things, which must be considered to get the most efficient ignition coils for your automobile. While opting for the ignition coils, it’s crucial to make sure that the ones you want are suitable for your automobile. Everyone will agree that nothing annoys like the thing, which you buy and have no opportunity to utilize. It’s especially depressing if the producer doesn’t provide any guarantees and has no return policies. So, before making any purchase, you must be sure that the chosen ignition coils will go well with your vehicle. It’s great if the pack contains 6 or 8 ignition coils. That will ease your job. Moreover, you may have some additional coils for emergency cases. Actually, buying a pack of several coils, you save your time and energy as there will be no need to seek for additional ones if something goes wrong. The prices for ignition coils are absolutely different. Usually, the cost is defined by a number of coils in the pack. Pack of 8 items is most likely to cost more. Besides, quality may be a pricing factor though it’s possible to buy good quality products at affordable prices. Anyway, it’s better to set a certain budget to know how much you can afford spending on such a detail. Clearly, you need to replace the coils before any serious malfunctions occur. It’s not advisable to wait till the coils are absolutely worn out as it may lead to negative consequences. But what’s the right time to consider the possibility of ignition coil substitution? In order to understand that, have a look at the following signs of failing ignition coils. If the exhaust produces fire, it’s a very bad sign. That happens after unburnt fuel is released to the exhaust system in the result of non-efficient functioning of the ignition coil. Very often, hard starts are the consequence of inefficient work of coils, which fail to fire the spark plugs properly because of the lack of energy. This problem is especially noticeable when the weather is cold. So, it’s necessary to substitute the coils before your car rejects to start at all. High fuel consumption can be caused by various problems and the malfunction of ignition coils is among them. When the spark plugs start to get less power for fuel ignition, the motor will try to gain the necessary amount of power in response to the throttle. Consequently, the electronics will do its best to compensate the decreased power by increasing fuel injection. Thus, the automobile will start to use more fuel. When ignition coils function improperly, the fuel is burnt irregularly during the combustion cycles and revolutions per minute start decreasing. That leads to rough idling of the automobile, accompanied by intense vibrations. The motor may stall or even stop to function at all due to problems with ignition coils. Failing coils lead to irregular voltage bursts, which, in their turn, result in inconstant spark production by spark plugs. So, if you notice any of these signs, think about immediate substitution of the ignition coils in order to prevent the situation deterioration. Moreover, take care of spark plugs as their malfunction often leads to problems with ignition coils. In a nutshell, there are many things, which you need to take into account while opting for the ignition coils. We hope that our tips will help you to notice any ignition coil failure at an early stage and avoid any harmful consequences they may lead to. Moreover, now, you know what ignition coils are the best ones.